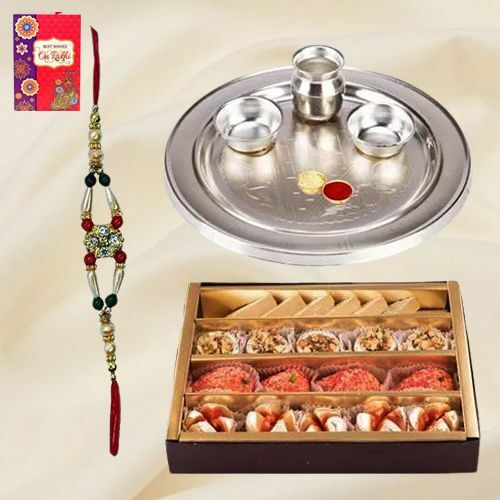 Deliver affectionate wishes and prayers for the people you love by ordering for them this Showy Thali and Endearing Aura of Raksha Bandhan with Toothsome Sweets supplemented with a Rakhi, Roli Tilak and Chawal free of cost. This extraordinary Hamper is stuffed with a traditional Thali of 52 gm. weight and array of 250 gm. Haldiram Sweets follows as Badam Katli, Kaju Pista Roll, Dry Fruits Chakki and Kaju Barfi.